According to the Catechism of the Catholic Church, "Jesus' entry into Jerusalem manifested the coming of the kingdom that the King-Messiah was going to accomplish by the Passover of his death and resurrection. 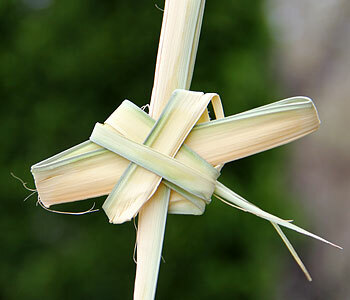 It is with the celebration of that entry on Palm Sunday that the Church's liturgy solemnly opens Holy Week." (no. 560) This year, we celebrate Palm Sunday, also known as Passion Sunday, on April 14. The reason it is called Passion Sunday becomes evident as the tone of the Mass radically changes with the reading of Christ's passion and death as the Gospel for the day. The stark contrast between the people first welcoming Jesus and then turning on him, calling for his crucifixion, stands out in the experience of this feast day. Palms were used in Jewish tradition to celebrate triumph or victory. For Christians, the palm branch became a symbol of martyrdom. The blessed palm frond that everyone receives at this Mass is a sacramental to take home. Traditionally Catholics keep their palms near or behind a crucifix, on a prayer altar or with their Bible. Keeping the palm serves as a reminder to remember Jesus' Passion and follow in his footsteps to carry the crosses in our own lives. Catholics are asked to bring their palms back a year later to be burned so the ashes can be used on Ash Wednesday to begin Lent anew. For those who don't return their palms to be burned for Ash Wednesday and want to dispose of them properly, the same rule applies as with any blessed object. They should never be disposed of in the trash. The proper way is by burning or burial. With blessed palms, it would be appropriate to bury them in a flower garden at your home.